Take your practice to the next level! 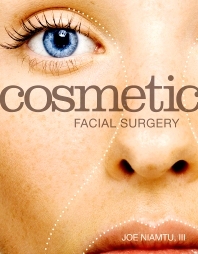 Cosmetic Facial Surgery provides a highly illustrated, case-based approach to common face and neck procedures. In this full-color reference, internationally renowned surgeon Joe Niamtu III, DMD, covers techniques including brow, face, and neck lifts; nose, eye, and ear surgery; cosmetic surgery practice with discussions of the process of facial aging, diagnosing and consulting with patients, clinical digital facial implants; skin resurfacing; the use of neurotoxins; and the removal of skin lesions. The book also prepares you for photography, and anesthesia considerations. In a companion DVD, video clips feature Dr. Niamtu demonstrating key procedures addressed in the text. Over 3,000 full-color photos show surgical techniques and before-and-after shots of actual cases done by Dr. Niamtu. A DVD includes videos of procedures performed by the author, bringing complicated procedures to life.